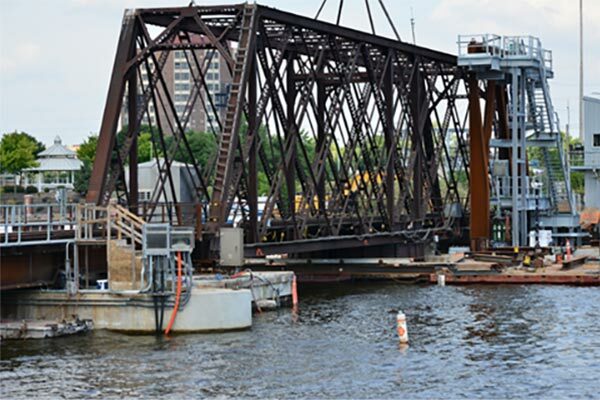 Kraemer replaced two truss spans with DPG spans and a vertically lifting bascule bridge swing span on the 114-year-old Canadian National Bridge over the Fox River. The bascule span produced a more reliable, wider, navigable channel for boat traffic. Three switchouts were performed: two 12-hour and one main switchout with 36-hour blocks. The two 12-hour switchouts included the removal of two 150-foot fixed truss spans, installation of two 60-foot DPG spans, and one 30-foot temporary span. The 36-hour switchout included the removal of a 180-foot swing span, demolition of two existing rest piers and one pivot pier, float-in track spans, setting rack frame, removal of two temporary spans, and installation of 350 feet of rail.